Renew 145 is our water saving special. Read all about rainwater tank options in our Rainwater Tank Buyers Guide. The lovely passionfruit vine-covered rainwater tank featured on our cover demonstrates that even dense inner-city houses can easily hold back most of their stormwater runoff—saving water, cooling cities, reducing flooding problems and protecting rivers. 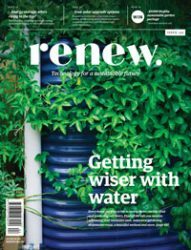 Our special feature includes many case studies of rainwater tank use, larger-scale stormwater projects, beautiful wetlands and waterwise gardens. Plus we examine the regulations around solar upgrades, look at where the energy storage market is at, update on electric vehicle options in Australia and follow several inspiring community-based energy projects. Plus much more! Get your copy now with free shipping in October! SKU: R145. Category: Renew. Tags: electric home, EV, garden, heat pumps, ReNew, Energy Efficiency, Energy monitoring, Solar. 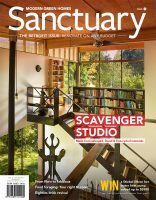 Issue 145 is hot off the press and full of advice for your sustainable home this spring. As always, Renew comes overflowing with articles to satisfy both the technically and the not-so-technically minded. Regardless of whether your interest is choosing a rainwater tank, understanding how to create a water saving garden, installing an energy storage system or what to look for when buying an EV, there is something for everyone in this issue. With ‘her friend, the mattock’, Mara Ripani is planting out a wetland and reaping the benefits in diversity, beauty and joy. Tips from a WA garden designer on designing a waterwise garden. Materials, siting, sizing, filters, pumps and more: what you need to consider when installing a tank. Plus rainwater tank case studies x 6. So many benefits from stormwater use on show in these great projects. Where water gets used in the home. Lance Turner updates what’s happening in the market and what to look for. These high school students learnt how to test for air leakage and become proficient DIY-installers—leading to great results for the homes involved, and benefits for the whole community. Plus a case study household. Do you have a failed inverter, failed panel or just want to get a bigger solar system? We survey the options and challenges. TRY is leading the way with a plan to be 100% renewable by 2022. Here’s what they’ve done so far and the exciting developments about to happen in Yack. Even those in the know can end up with a raw deal on their energy bill. Engineer Andrew Mitchell explains his own ‘wake-up call’ and what he (and you) can do about it. What electric vehicle types are available and how do you work out which will best suit your needs? Bryce Gaton offers a suggested ‘ideal’ usage pattern for each to assist your choice. How do you charge an electric vehicle if you live in an apartment or unit?